I’ve been slacking on adding recipes since Macy got sick, but Karyn has still been cooking up good stuff making my mouth water! I can’t wait to post all the yummy recipes she’s been sharing with me! Doesn’t this lemon cake look scrumpticious? Even though I’m not a fan of zucchini, I would’ve given this lemon zucchini cake a taste test as I love lemon desserts! Beat eggs, zucchini, oil and pudding mix until smooth. Add cake mix. Mix on low until moistened, then mix on medium speed for about 8 minutes. 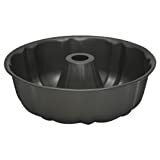 Pour into greased bundt cake pan. Bake 335 degrees for 50 minutes or until done. Let set in pan for 10 minutes. Turn out rack and let cool. Frost as desired. This is good with cream cheese frosting. Karyn served her lemon bundt cake with strawberries. Delicious! Karyn found this recipe in the “The Observer”, a Yankton, South Dakota newspaper. The recipe was submitted by Lois Anderson.